Comic book trailers have been a staple of the comics industry for over ten years. 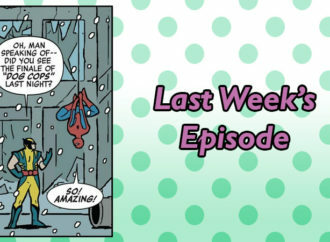 The short visual previews of a new series is a fun way for fans to anticipate comics releases, and an effective marketing method for publishers. It’s hard to say what the first comic book trailer was. 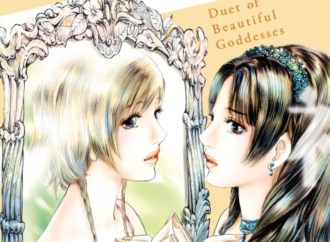 The earliest one available on YouTube is from March 2007 by Virgin Comics for a seemingly cheesy and cliche series called Devi. Following the YouTube timeline would indicate that comic book trailers became popular in 2010. 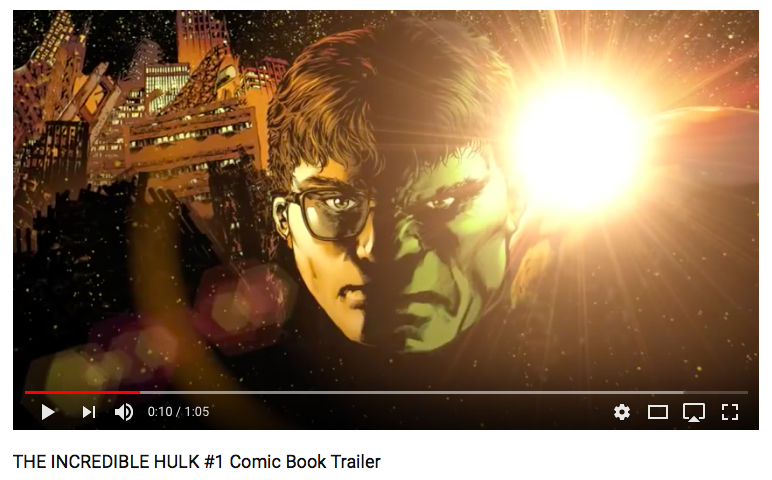 An example of a 2010 teaser is a trailer for the Mark Silvestri run of The Incredible Hulk. From that point on, trailers seem to be commonly found bonus content released for special comic books when a publisher wanted to drum up business via pre-orders. 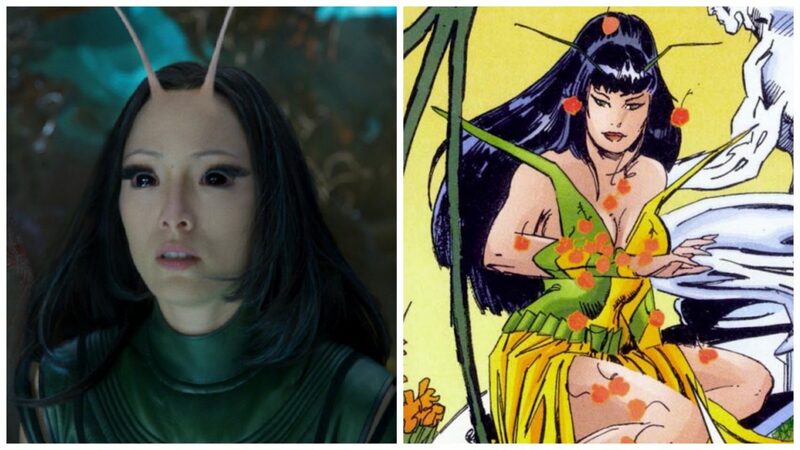 Styles of comic book trailers vary. All of them have music. Every trailer shows panels from the comic books they are meant to advertise. Some of them have text laid over the comic panels for viewers to read, like Greg Pak’s Planet Hulk trailer from 2010. Other comic book trailers add depth to certain pages from the comic book and animate using zoom effects with narrators, such as Marvel’s Avengers: Rage of Ultron trailer from 2015. Still others scrap the narrator and text entirely, and use intricate animation to the point where the viewers ask: is this a preview for an animated series or a comic book? A prime example of such a one is the 2013 teaser for IDW’s Banshee: Origins, which had the actors from the comic’s namesake Cinemax TV series voice act as their respective comic counterparts. In 2018, there have been a lot of comic book trailers. Highlights from the year so far include trailers from BOOM! Studios, Image, and Dark Horse. There are several worth watching for the animation, music, and composition alone. 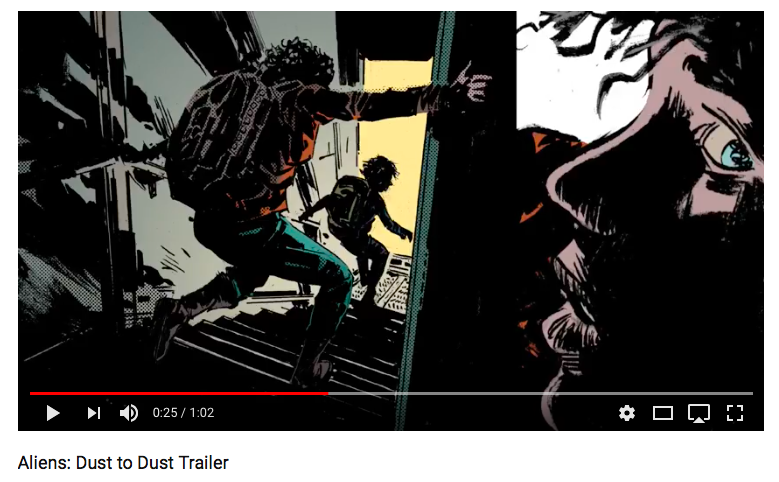 Among those are a trailer for Image’s Prism Stalker animated by an independent creative team, a teaser for Dark Horse’s Aliens: Dust to Dust, and BOOM! Studio’s Coda trailer. These are just a few of the myriad of comic book trailers out there for fans of animation and comic books to watch. Not all comic book trailers are thoughtfully considered, because some of them are just advertisements. They don’t immerse the viewer in the world of the story, or elicit the imagination. They lack sound effects, good animation, or heart. 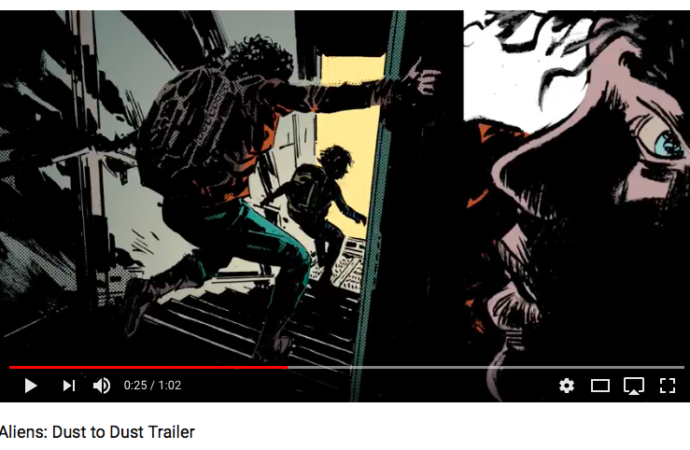 A well made comic book trailer evokes some kind of curiosity or emotion from the viewers, who will potentially become readers who explore that other world in depth as time goes on. 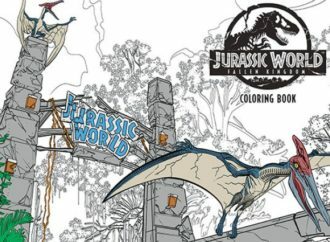 WWAC went behind the scenes with Dark Horse Comics, a publisher who puts out dozens of comic book trailers a year, to find out about the process of creating an immersive experience for the viewer. 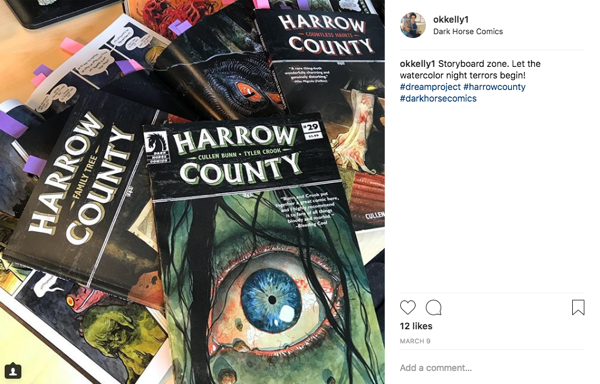 Dark Horse’s Digital Marketing Manager Kelly Woessner took us on a journey inside the collaborative undertaking behind the publisher’s comic book trailer production. How do you choose which comic books will get a trailer? I’d love to be able to do trailers for everything that Dark Horse publishes, but ultimately it comes down to time. We’ll look ahead at our heavy publishing schedule and ask ourselves where a trailer would make the most sense. Most of the time, I’ll make a trailer for a new series launch or a highly anticipated book like The Legend of Zelda Encyclopedia or Angel Catbird. Making trailers is just one of many roles I play as the Digital Marketing Manager at Dark Horse. Basically, if there’s time for it, I’ll do it. How long does it take to put together a trailer? Tell us a little bit about that process? Trailers can take anywhere from a couple of days to several weeks to create. It all depends on how quickly I’m able to lock down the overall concept for the trailer, and that has everything to do with how I connect to the material on a creative level. The first step is obviously just reading the comic a few times to get an idea for the overall pacing and tone. I look for the different ways that the art and writing play off each other. In Black Hammer: Age of Doom, for example, there were all of these catchy lines that I knew I wanted to use in a narration. There’s a natural ease to Jeff Lemire’s writing that lends itself to the narration. Other times, I’ll let the art do all the talking like in the trailers for Aliens: Dead Orbit and I am a Hero. Making a trailer for a comic book sometimes feels like I’m trying to build a tiny house out of a mansion. I’m taking someone else’s work, someone else’s vision, and stripping it down to its most essential and functional elements. I feel a responsibility to the writers and artists to not only get it right but to make it shine and make it fun. Once I’ve got an overall sense of the trailer’s structure, I can start editing and animating. This is my favorite part of the process. I’m not that big on animation that distorts the art in any way. 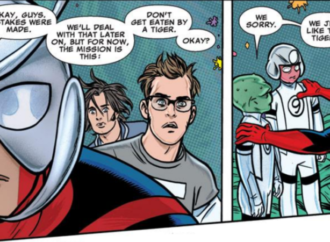 Animation can be a slippery slope with comics trailers because obviously, we’re working with a static image. The trick is to find the dynamics in the panels and to let that inform how I edit or create motion graphics. All of those clues are right there in the panels themselves. If you think about it, comics art is a lot like a fancy storyboard. They direct your eye in specific ways. I try to approximate what the reader would be seeing and hearing in their imaginations while they read a comic. Then I use that approximation to inform how the trailer will feel. How do you choose the music for each comic book trailer? Most of the time I collaborate with freelance sound designer and friend, Cary Sigler. Once the editing is mostly finished, I’ll bring the rough cut to his studio and together we’ll start creating sounds. I’ll give him direction like, “I need a sound that’s like grinding teeth underwater,” or, “This needs to sound like an ’80s after school special where everything is crisp and shiny.” Using synthesizers, samplers, and other instruments, Cary will turn knobs and push buttons until we create the exact sound we need. Since the trailer is mostly edited at this point, there’s already an established rhythm that we use to help determine our beats per minute for the music. The Seeds trailer, for example, had this slow, creeping pace that I kept describing as labored breathing. The art is filled with images of discarded technology, gas masks, plastics, monitors, etc. So the music needed to have that distorted, dusty, synthetic feel. I paired that with some simple acoustic percussion to help anchor the sound and make it feel more organic. 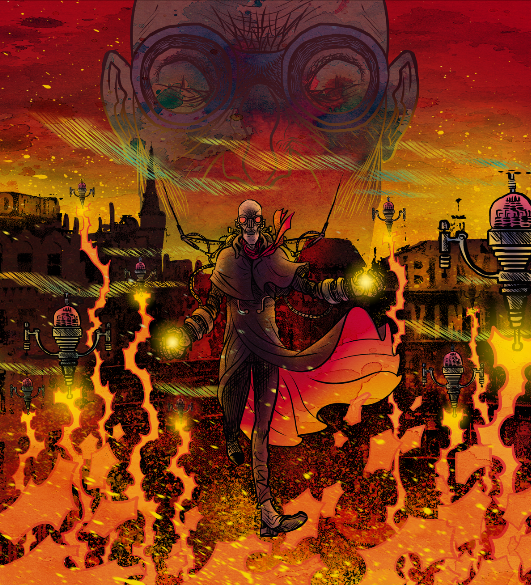 A great example of how the art informs the music is this panel from Sherlock Frankenstein & the Legion of Evil. 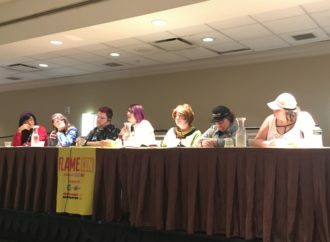 This panel is incredibly musical. Sherlock Frankenstein has the menacing swagger of a cool villain. It almost looks like a Western, as if at any moment he’s going to say, “There’s a new sheriff in town.” I wanted music that had a strut to it but also offered a full spectrum of sounds. Saturated colors make me think of bass instruments and deep, oscillating tones. But David Rubín’s art can also be playful and soft. So, we sprinkled in some warm chords and acoustic piano to add some brightness. It’s all about assigning sound to color, texture, and movement. What’s your favorite comic book trailer you’ve ever seen? I loved Skybound’s trailer for Redneck by Donny Cates. That one blew my mind. They absolutely nailed it! The sound effects and the music are perfect. They let the art speak for itself without adding a lot of bells and whistles. It’s creepy, it’s dark, and it leaves you wanting more! I think they achieved something very special with that one. They had it playing on a loop in their booth at SDCC, which was directly across from the Dark Horse booth, and I honestly never got sick of it. It’s just that good. Do you have a favorite trailer project you worked on? I love them all, but the trailer I made for Harrow County is my favorite. That one was unique because we decided to make a trailer as the series was coming to an end. It was a retrospective trailer that also hyped the series finale. I literally had hundreds of pages of Tyler Crook’s jaw-dropping art to choose from. It was a little intimidating. Harrow County is one of my all-time favorite comics too. That trailer ended up being a collaboration between myself, Cullen Bunn, Tyler Crook, and Ma’at Crook. Cullen wrote a perfectly creepy narration which Ma’at narrated as the voice of Emmy. Tyler sent me music he’d written for Harrow County way back when they were making the first issue. Then I added some of my original music as well. Editing all fell in to place from there. I love that trailer. And it turned out to be one of our most viewed videos of the year which was really exciting! What are your hopes for comic book trailers moving forward? Comic book trailers seem to be on the rise which is exciting. Dark Horse has a legacy of working with some of the best artists and writers in the industry, so there’s always going to be something new and exciting on the horizon. There’s so much great work being done in the world of motion graphics. I look for inspiration all over the place. I hope that I can keep making these trailers the best they can possibly be while learning some new tricks along the way. So many television shows open with some kind of elaborate motion-graphics or animation sequence using still images. I’m currently obsessed with the work of a company out of Los Angeles called Elastic. They’ve created main title sequences for True Detective, Westworld, American Gods, just to name a few. I feel like they’re leading the charge in this niche field. At the end of the day, all we’re doing is moving stuff around a screen with music and sound effects. But if we can do that in a way that tells a story and gets people interested and excited, then we’ve done our jobs. Anything exciting trailers you’d like to share with us, that we can hope for from Dark Horse in the near future? 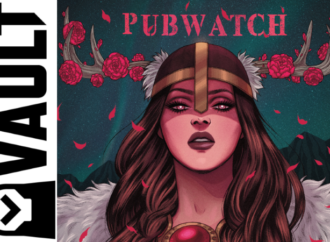 If you check out our announcements from SDCC [this year], you’ll see that there’s a lot to be excited about at Dark Horse. William Gibson’s Alien 3 is going to be incredible! I never pass up an opportunity to make an Alien trailer. G. Willow Wilson’s Invisible Kingdom from Berger Books looks astonishing. And of course, Stranger Things is going to be so much fun! Working for Dark Horse means that there’ll never be a shortage of exciting comics on the horizon. And that means we’ll need trailers, lots of trailers.